Last month we took an inspiring trip to Mexico City, which in recent years has become a top food and design destination! After five days of leisurely exploration, we distilled our trip down to our favorite stops for design-minded travelers. The best part? The flight from SFO to CDMX is only 4.5 hours! 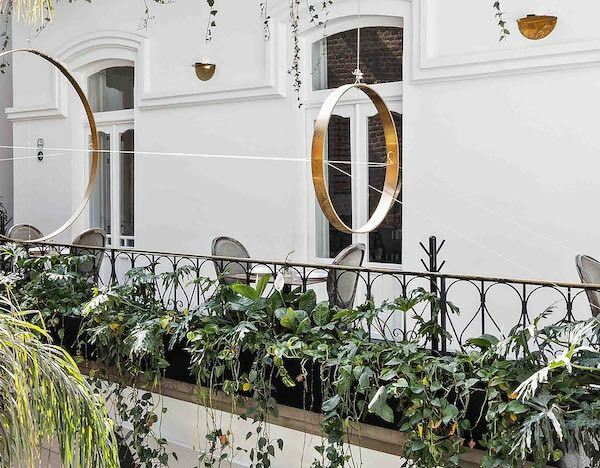 Founded by art collector César Cervantes, Tetetlán is a modern cultural center housing a restaurant, café, local store, library, wellness center, and cheese cellar. It began as an effort to preserve and restore Luis Barragán’s Casa Pedregal, located in a suburb built on volcanic rock on the southern outskirts of Mexico City. The new architecture of Tetetlán is just as impressive, so visit for both the restaurant and the guided tour of Casa Pedregal. Make sure to reserve your tour spot in advance via email. Located in the hip, historic neighborhood of Roma, Blanco Colima is a perfect lounge spot for food, drinks, and good music. Housed in a restored mansion, the space holds three restaurants as well as traveling exhibitions, movie screenings, and workshops. Reservations are a must for tables, otherwise you can take food at the bar! La Condesa is one of the best neighborhoods for a stroll with its beautiful small streets and modernist architectural gems such as Kurimanzutto. Check out the contemporary art exhibitions and the stunning gallery spaces. 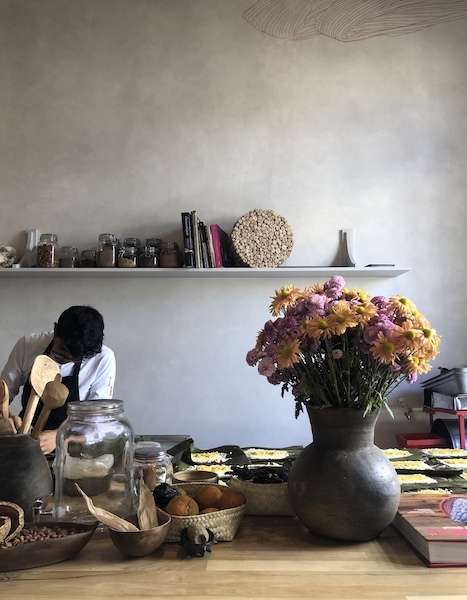 While in Mexico City, we caught up with our friend Regina at her minimalist, jewel box of a tamales shop, Tamales Madre. With a simple menu of gourmet tamales and sides such as cactus salad, this was hands-down my favorite meal of the trip. Save room for the dessert tamales - they are not to be missed! Built in 2007, Biblioteca Vasconcelos is a massive library that feels both futuristic and magical at the same time with its endless, cantilevered shelves of books. It’s a sight to see in person. 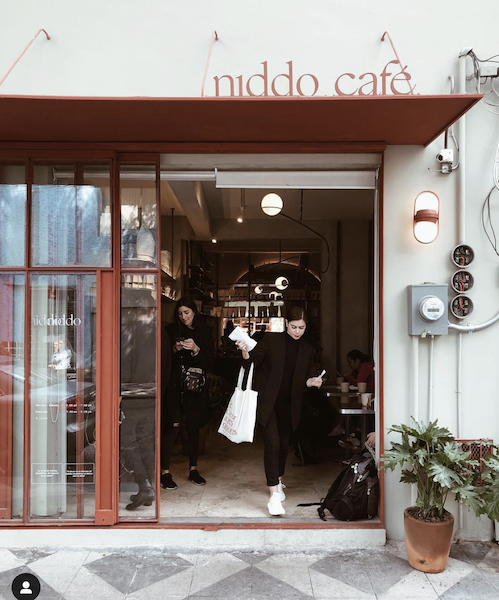 Both restaurant and cafe, Niddo is a beautiful and delicious spot to take a break from sightseeing. The attention to detail that went into the design of the cafe is an absolute delight, and we’re only showing you the exterior! Try the locally bottled Tamarind kombucha for a refreshing drink. For a functional souvenir, stop by Studio davidpompa and pick up a light fixture designed and fabricated in Mexico City! The lighting and objects are displayed alongside the raw material from which they’re created, elevating the showroom experience. Last on our list is another Luis Barragán work: Casa Gilardi. What makes Casa Gilardi and Casa Pedregal interesting to visit is that people still live there! 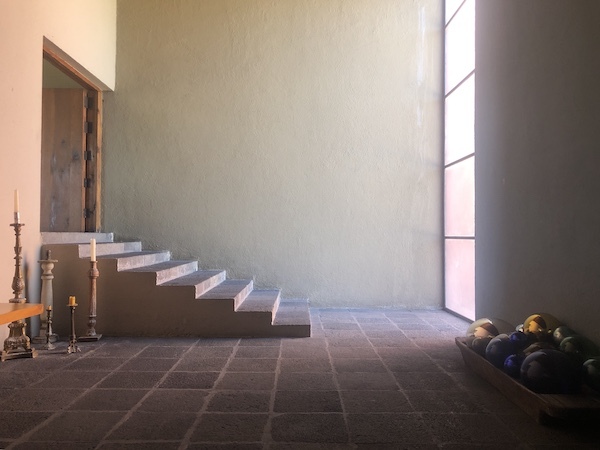 The tour for Casa Gilardi is run by the sons of the man who commissioned Luis Barragán. While a small house and Barragán’s last work, the use of color is brilliant and a sight to behold. You can book the tour directly through Facebook Messenger. There’s still many more places on our list that we didn’t get a chance to visit this time around. Tell us your must-see Mexico City destinations in the comments below!